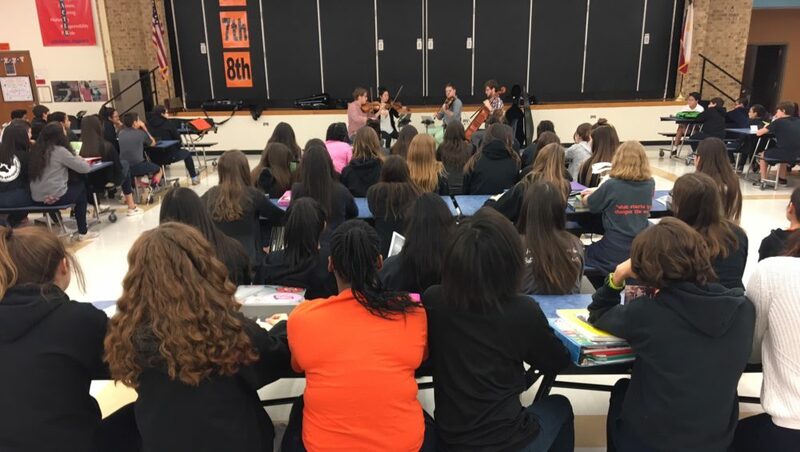 Bright and early on this Monday morning, the young musicians of the Aeolus Quartet started off with some Mozart (Adagio & Fugue K.546) before talking with the 200 or so students gathered in the Auditorium/Cafeteria. They established excellent rapport right away, introducing the audience to each of their instruments, with an explanation of their individual roles within a string quartet. The morning continued with more music by Schumann (String Quartet Op.41, No.3, 2nd Movt. ), Copland (Rondino), and Barber (String Quartet in B-Major, Op.11, 2nd Movt.) before breaking into a very lively Q & A session: the students (and teachers!) asked and the Quartet answered a wide range of questions including – motivation for practicing; breathing together when playing in ensemble; music as a viable career; music as a form of communication; and music serving as a balance in our modern-day tech-filled life. Well, that made our day!